Download our brochure as a pdf. 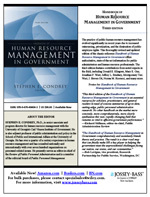 is a human resource consulting firm dedicated to bringing state-of-the-art human resource management techniques to state and local government. We utilize a hands-on approach and encourage participation by agency personnel. While many consulting firms provide human resources consulting services, state and local governments are Condrey and Associates primary clients. We invite and encourage you to compare the quality of our services with those offered by other firms. Dr. Steve Condrey has directed human resource projects in over 800 jurisdictions. All of Condrey and Associates consultants have extensive experience in state and local government and are well prepared to provide high quality service to their clients.